Time for another visit to yesteryears shopping malls in Sweden, this time focusing on a gem located in the suburbs of Gothenburg in the southwest parts of Sweden. The Frölunda Torg mall was built in 1966 and was by its completion the biggest mall in Europe. It took seven years and 80 million Swedish Krona (approx. $10 000 000) to complete it. In 1974, another 13.300 square meters was added with 14 new shops and one restaurant. 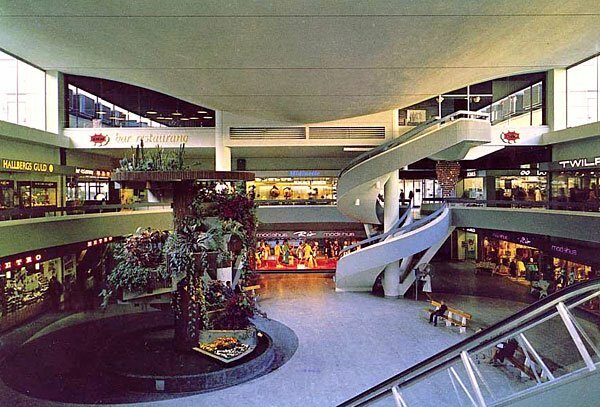 In the 1983 there was another big expansion phase, when Domus (ex nationwide department store chain) moved out from two of their three levels in the mall and made room for another 11 stores. Today there are over 100 stores and 11 restaurants located within Frölunda Torg, but all the swank and lush design has been changed greatly. You can find their current website here. UPDATE: Turns out that the design and layout of the mall hasn’t changed that much over the years as I suggested, but in a recent proposal they do have major changes and additions planned for it.